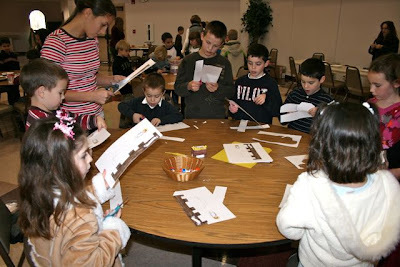 Last Friday our homeschool group had an Advent Craft Fair, after First Friday Mass. 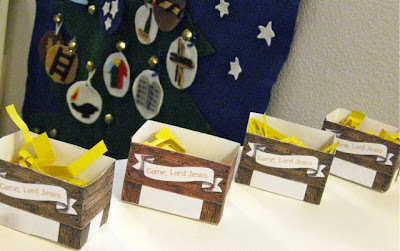 Each mom was asked to bring a craft for about 25 children based on Advent, Christmas, or one of the December Saints. Since I had spent Wednesday night and most of Thursday contracting, and wasn't sure we would even be able to make it, I hadn't spent any time thinking about what I would bring. So, early that morning, I was trying to come up with a craft QUICKLY!! I was so thankful to have Catholic Artwork's Teacher's Helper CD's to turn to. (When I ordered CD's from Catholic Artworks, I purchased the whole set of 21 Teacher's Helper CD's and the Faith Keepers Combo. With the complete set discount and the 50% off for Homeschooling Parents, they were only about $5 each.) 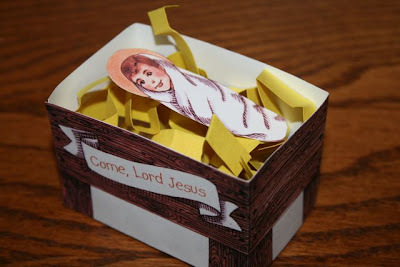 Anyhow, on CD #2 I found the cutest little craft for making a 3-D Manger. Within minutes I had 25 copies printed out on to card stock and yellow construction paper for the children to make "hay." I grabbed a basket of scissors and glue sticks and was ready to go! 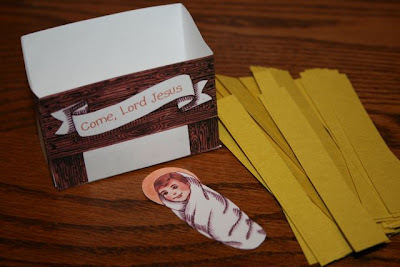 As the children worked on cutting out and assembling their mangers, I explained to them that, for the rest of Advent, every time they make a sacrifice or do a good deed for some one else, they can add a piece of "hay" to the manger and prepare a nice soft place for baby Jesus on Christmas morning. This has been something I've wanted to do with my children for a couple years anyways, and have never managed to incorporate, so I was excited to find this simple craft! The children all loved the idea too and mine have been very busy coming up with little sacrifices so they can fill their mangers for baby Jesus! 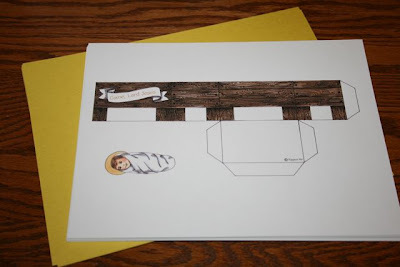 *Here is a link to a free online printable manger in case you would like to do a similar craft with your children! These are adorable! FYI for next year- my children make a paper chain out of yellow paper to count down the days until Christmas. Each night before bed they talk about what sacrifices or good deeds they did for baby Jesus and then add the paper to the manger. Just a neat way to add it into the day! What a neat craft! I've seen the little kits you can purchase, but this looks like a great alternative. Thanks so much for sharing.